Look twice, is not just a saying the motorcycle groups have come up with in order to have a cute motto. It is for a reason. My nephew was killed this week in a motorcycle accident. He was only 19 years old. He was cautious, he wore a helmet, but when a car traveled directly into his path while making a left turn, no amount of cautiousness could protect him from avoiding the vehicle. Please be careful out there on the roads and LOOK TWICE! 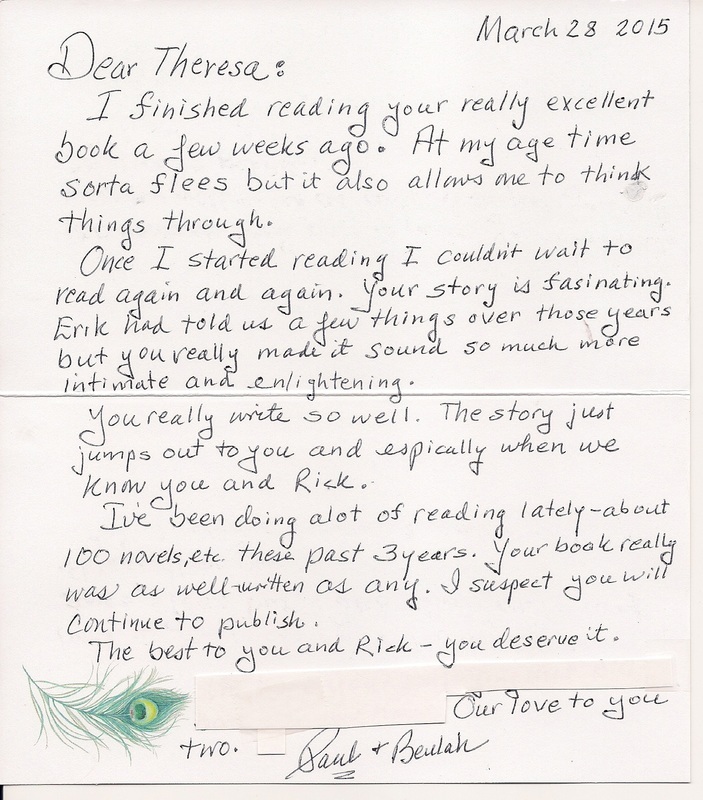 I received this letter from my husband's 95 year old uncle this week and I wanted to share it with my website viewers. Paul Larsen has a PhD in education and was the dean of a college in North Dakota for many years before retiring. I sent him a copy of my memoir and was touched by his response. I wanted to thank him publicly for his kind words. After I finish a tennis match on Wednesdays, the tennis ladies and I always go out to lunch. In fact it's the best part of the day, especially if you lose. The subject of food and what to eat, weight and fitness are often at the table. As the topic was discussed it made me wonder, what are we eating? I am always looking for better, healthier ways to eat and thought this was an interesting option. So, I decided to see how much sugar was in certain foods. I knew cereals were high in sugar, but I never realized how many things contain sugar, such as lunch meat, spaghetti sauce, pasta, bread, and salad dressing. Items that I would consider healthy. I decided I would give it a try and attempt to cut out as much sugar as possible from my diet. As well as cutting out sugar, I also read the book Food Rules by Michael Pollan. This was a fascinating and quick read. Full of funny and oh yeah, that makes sense kind of advice. Like, "Don't eat breakfast cereals that change the color of the milk." and "Don't eat anything served through your car window. Don't eat anything your great-grandmother wouldn't recognize as food," and the #1 rule on what to eat would be "eat food." So with these two theories in mind I decided to change the way I ate. It didn't happen overnight, but it didn't take as long to change my habits as I thought it would. I started just before Easter of this year. Yes in the middle of chocolate eggs, sugar peeps, and jellybeans. I didn't eat any of those things and instead ate more vegetables and a piece of fruit everyday. I even broke down and bought a bread maker and made my own pizza dough, bread, and rolls. It has been an interesting experience. After two weeks I had more energy, and even though I still felt tired in the day, I felt better inside. My goal was not to lose weight, but to feel better, however I did lose inches on my hips, stomach, and the dreaded over 40 year old women's back flab. Those were problem parts of me that I had come to accept as "getting older," but now I don't have to. Michael Pollan said "even moderation in moderation." This is so true. We often get so caught up in diets or healthy eating that we forget to treat ourselves. I still have my glass or two of wine at night, and I can't seem to drink coffee without my chemical-free creamer that has some sugar added, but I only have a sweat treat on special occasions and when I do I either make it myself or buy something decadent that I would not normally buy. So, if you want to feel better and even lose a few pounds try cutting out the thing that is making Americans sick. . . sugar. Good Luck! I am reading a book for my book club by Liane Moriarty called "Big Little Lies." It is laugh-out-loud funny and extremely insightful. I will not give away specifics, but the author nails the ex-husband, ex-wife, new-wife triangle so well that I wondered if she had been through a similar scenario in her own life. I felt at times that she was writing about my own life. Then there is the abusive relationship. Liane Moriarty is dead on with the description of this couple, the dynamic surrounding the abuse, and how there is a trickle down effect to others. If you are looking for that funny, dramatic, "wow I can see myself in that person" sort of book, read "Big Little Lies." I don't think you will be disappointed. One of my favorite activities I participate in every month is book club. I love getting together with the women in my group, talking about the book we read, discussing a new book, catching up on "Downton Abbey" gossip, eating good food, and having a glass of wine or two. I find it socially and mentally stimulating. I look forward to it every month. We often read things that we would normally never pick up. 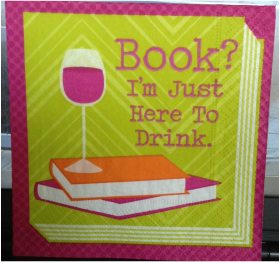 That's the beauty of a book club. It allows you to step out of your typical reading genre and try new and adventurous ones. The best part is if you don't like the book you just read, there will be another one to read next month. I finished reading this remarkable book. My favorite public praise for the writing was by JOHNS HOPKINS MAGAZINE: "Mahoney drinks in landscapes and people and turns them into page-turning meditations on the self and herself. . . . The resulting book is a compassionate realization that seeing isn't the only path to knowing. . . . Mahoney tries to understand sightless reality, and she does it with such blunt tenderness that it lends her writing a shambolic glee. 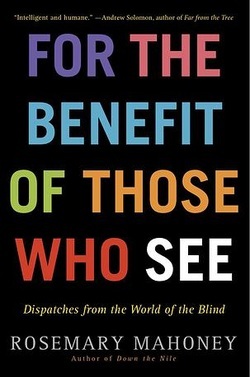 Though she alludes to secondary sources—philosophical considerations of blindness, medical accounts of sight being restored to blind patients—it's her experiences that make Benefit so thoughtful." I found her book to be inspiring in many ways. It opened my eyes to how much we miss every day by seeing instead of experiencing. She wrote, "Sight is a slick and overbearing autocrat, trumpeting its prodigal knowledge and perceptions so forcefully that it drowns out the other, subtler senses. We go through our day semi-oblivious to a whole range of sensory information because we are distracted and enslaved by our eyes. Taste, touch, smell, and hearing can hardly get a word in edgewise to the brain. Those of us who have sight do not realize that our experience of life and the world is overpowered by our vision. In this sense, we too are handicapped. . . I saw that I had been missing a great deal of what was happening in my daily life, and I realized that it was not the blind person's deficiency that was drawing me into this subject but the revelation of my own." During and after reading this book I found myself sitting quietly with my eyes closed, trying to use my other senses. It is a wonderful way to draw yourself into mindfulness, being present in the moment. Read the book for yourself and discover Rosemary Mahoney's wonderful journey. Cutting the Soul by Theresa Larsen is a powerful and emotional memoir of her son's mental illness and her struggles to cope with keeping him safe and well. I applaud the author for bringing her story of a mothers' love in dealing with the issues of a mentally ill child to the public. My son has finished reading the manuscript and he gives me his blessing to proceed. I am so proud of him for being brave enough to read it. As he read he would text me with questions or comments. Close to the end he wrote, "It's weird reading my quotes because I can remember writing them. Don't mean to scare you though. It's just interesting." I replied that it didn't scare me and was glad he remembered writing the journal entries. I told him that so many of his writings fit perfectly into the book and I worked hard to incorporate them in the right places. My son said, "You did well mom :) Thank you. I love you." Wow as a mother, that was about the best thing he could have ever said to me. I thanked him and said I hoped that reading the book helped him understand why we did the things we did and if it did the writing was worth it. Even if it doesn't go any further than him reading it. He told me that it did help him understand what we did, now more than ever. And he hoped the book does go further and reach other people and help others. He said, "It's a great book!" Onto the publishing...I will keep you posted. I had a weird dream/deja vu/synchronicity moment today. I dreamed last night that I had dirt or something dark under two or three fingernails on my right hand. When I was having coffee this morning, I looked at my right hand and noticed two of my fingernails had something dark under them (deja vu), so I cleaned them. Several hours later I spray painted some wood in our garage a dark brown. The first spray can worked wonderfully. When it ran dry, I grabbed another, but this one oozed out as I sprayed, leaking dark brown paint over three fingers of my right hand. When I came into the house and washed my hands, the paint would not come off with soap and water, so I dug out the nail polish remover and began scrubbing. I managed to get all of the paint off except some dark bits under three fingers of my right hand (synchronicity). WIERD!! What does it mean? Maybe I need to wear gloves next time. Another book update. I am reminded of the quote from Winston Churchill that I posted on January 30. Wow I can't believe it was that long ago! "Writing a book is an adventure. To begin with, it is a toy and an amusement; then it becomes a master, and then a tyrant. The last phase is that just as you are about to be reconciled to your servitude, you kill the monster, and fling him out to the public." The tyrant is here and screaming at me daily. I am working furiously to get this book complete. I have less than twenty pages to edit and after that there are only a few more things to do before I fling it out to the public. Life's not about waiting for the storms to pass . . . It's about learning how to dance in the rain." "Writing a book is an adventure. To begin with, it is a toy and an amusement; then it becomes a mistress, and then it becomes a master, and then a tyrant. The last phase is that just as you are about to be reconciled to your servitude, you kill the monster, and fling him out to the public." I am in the master stage, but I feel the tyrant approaching. I was happy to see the next season of Downton Abbey begin this week. The season begins in 1922. This was very exciting for me because it was the year my father-in-law was born. I find it hard to believe that he was born during this era. He has seen incredible things throughout his life, from the inventions-jet engines to Velcro, the wars, and medicines. He is still witnessing amazing things that continue to go on in the world. I am thrilled to be documenting his life. Erik, in the middle, with his family at one year old. Erik with his granddaughter in 2013, 91 years old. I am deviating from my usual blogs on mental health, parenting, or life lessons to something I have been working on for several weeks; changing the color of the grout on my bathroom floor. It was laborious, but worth it in the end. Someone asked me why I did not just hire someone to complete the job. I thought about doing so several times. In the end I am glad I did the work myself and can be proud of my accomplishment. So here is my step by step, with actual pictures, instructions. Using the grout colorant cleaner, spray and clean grout as recommended on the bottle. I used a product called Aqua Mix and ordered the color I thought would look best in the grout. You can get samples if you are unsure. Next, gather all the materials. I used a sponge, cloth, small paint brush, plastic disposable plate, toothbrush, and the white scrubbing brush I purchased with the Aqua Mix products. Even after cleaning, my original white grout still looks dingy and dirty. Cover areas you don't want colored with painters tape. Add colorant to the disposable plate. I wore a disposable rubber glove to keep the colorant off my skin. It is not essential because the color comes off easily with hot, soapy water, but it made it a little easier. Use the toothbrush to gently brush the colorant over the grout. Keep color off tile as best as you can. If you have tiny tile like mine it is difficult to keep color only in grout, so wipe off with a sponge within 15-20 minutes. Use a damp cloth to wipe excess colorant after using the sponge. After wiping colorant off tile, you may have to retouch grout with the toothbrush or a small paint brush. Let the grout dry for at least two hours before walking on it. Then either the same day or the next day use the white scrubbing sponge to scrub off any remnants of colorant on the tile. 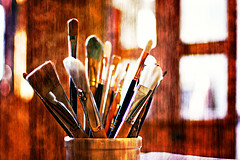 A final touch up with the small paint brush on certain areas of the grout may be necessary. to this, a big improvement. I was thrilled with the transformation. My marble, basket weave pattern tile was pretty with the white grout, when the grout was white, but it was awesome with the light gray grout. It gave the tile a richer, more textured look. and it cost less than $60 to complete. I used one bottle of grout cleaner and two bottles of colorant to complete my approximately 6 x 15 foot bathroom floor.